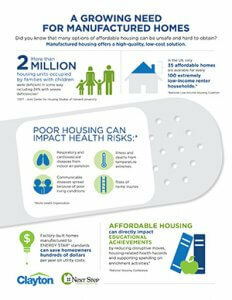 There is no doubt that affordable housing remains a key challenge to communities across the country. Every single U.S. county has a shortage of affordable housing. Only 35 affordable and available rental homes exist for every 100 extremely low-income renter households. As communities and families seek affordable housing options – one solution is often overlooked: manufactured homes. This is why we partnered with Clayton to author a new white paper to address the stigma of manufactured housing, and present the reality of today’s high performing, energy-efficient homes. Manufactured homes offer an affordable homeownership option for hardworking families looking for their piece of the American Dream. Increased access to homeownership creates wealth building opportunities for families, builds a greater sense of stability and responsibility, and contributes to vibrant communities across the country. Making affordable housing available to all Americans is a daunting challenge that will not be achieved by any single approach. Next Step and Clayton Homes believe that it is important to include manufactured housing in the affordable housing conversation in communities across the country. Many communities and families have already discovered quality, energy efficient, affordable housing with Next Step and Clayton. We believe there is an opportunity for many more to achieve the dream of homeownership and discover its long-term benefits. Download Shedding the Stigma: The Value of Manufactured Homes.